At the dawn of the twenty-first century, we are living in a global era, yet schooling systems remain generally reactive and slow to adapt to shifting economic, technological, demographic, and cultural terrains. There is a growing urgency to create, evaluate, and expand new models of education that are better synchronized with the realities of today’s globally linked economies and societies. 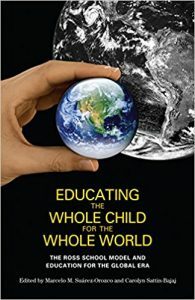 Educating the Whole Child for the Whole World examines one such model: the ethos and practices of the Ross Schools and their incubation, promotion, and launching of new ideas and practices into public education. Over the last two decades, Ross has come to articulate a systematic approach to education consciously tailored for a new era of global interdependence. In this volume, world-renowned scholars from a variety of disciplines, as well as veteran teachers, administrators, and students come together to examine some of the best practices in K-12 education in the context of an increasingly interconnected world. Together they explore how the Ross model of education, which cultivates in students a global perspective, aligns with broader trends in the arts, humanities, and sciences in the new millennium. Contributors: Nick Appelbaum, Ralph Abraham, Antonio M. Battro, Sally Booth, Michele Clays, Elizabeth M. Daley, Antonio Damasio, Hanna Damasio, Kurt W. Fischer, Howard Gardner, Vartan Gregorian, Christina Hinton, Hideaki Koizumi, Debra McCall, Carolyn Sattin-Bajaj, John Sexton, Carola Suárez-Orozco, Marcelo M. Suárez-Orozco, William Irwin Thompson, and Sherry Turkle.